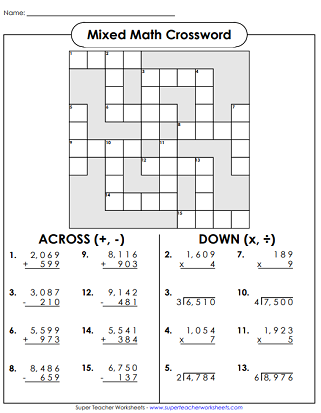 Math crossword puzzles make it fun for students to review addition, subtraction, multiplication, and division. 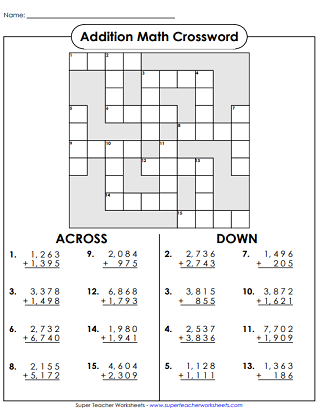 Add the numbers and write the answers in the crossword puzzle. Find the sums and use the answers to fill in the puzzle. Add thre three addends together. Write the sums on the crossword puzzle. 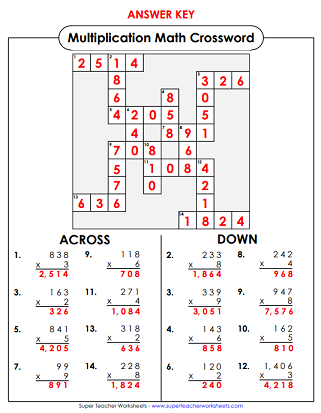 Find the answers to the subtraction problems and complete the number crossword puzzle. Subtract to find th four and five digit differences. The plug the numbers into the puzzle. Multiply the numbers to find the products. Use the answers to finish the crossword puzzle. Multiply to find the products and place the answers in the puzzle. Find the products of these four-digit by two-digit multiplication problems. Then complete the puzzle. Divide the four digit dividends. Use the quotients in the puzzle. Solve the addition squares puzzles. To complete the mystery pictures, students must practice addition, subtraction, multiplication, or division skills.